Just as construction began on this Asheville, North Carolina residence, a three-year historic drought hit the area, coinciding with the start of our recent recession. Taking a good hard look at their plans, the owners seriously re-thought the home in order to address both long-term ecological and economic hardships. 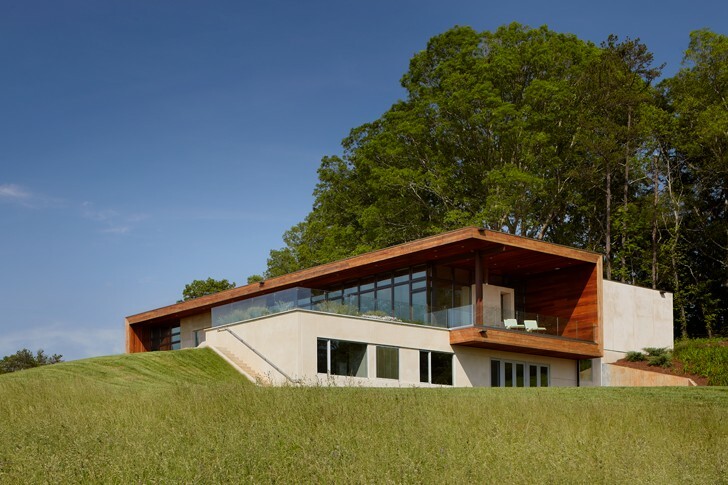 They worked with SPG Architects to radically improve the energy and water efficiency of the home, incorporating a green roof, rainwater collection, low-energy lighting and passive design. The resulting home met their design ideals while performing far better. The 3,444 sq ft Leicester House is accessed by a road that winds through the woods and leads up to a square-shaped entry formed from corten steel and cumaru wood siding. This top floor contains the living room, dining room, kitchen, and master suite, and tucked into the hill directly below is a guest suite, media room and utility room. When no guests are around, the extra suite can be closed to minimize energy use for heating and cooling. The other side of the home faces the south and west, opening up onto rolling hills and farmland. Passive solar design and natural ventilation are incorporated into the design to reduce energy usage. Rainwater is collected from 80% of the rooftop and stored in two 1,700 gallon tanks to irrigate the native and drought tolerant landscaping. The green roof improves insulation and reduces rainwater runoff. Heating and cooling is provided by a geothermal heat pump, and all window, appliances and building systems are energy-star rated. Permeable pavers allow storm water to infiltrate, and the interior of the home features energy-efficient LED, fluorescent and low-voltage lighting throughout. Originally the owners had hoped to include a swimming pool, but as a result of the drought they eliminated that option in favor of conserving water and energy. They also sought to reduce their overall environmental impact through the use of locally-made furniture and cabinetry, reclaimed materials, and no-VOC finishes. The top floor contains the living room, dining room, kitchen, and master suite, and tucked into the hill directly below is a guest suite, media room and utility room. When no guests are around, the extra suite can be closed to minimize energy use for heating and cooling. The other side of the home faces the south and west, opening up onto rolling hills and farmland. Passive solar design and natural ventilation are incorporated into the design to reduce energy usage. Rainwater is collected from 80% of the rooftop and stored in two 1,700 gallon tanks to irrigate the native and drought tolerant landscaping. The green roof improves insulation and reduces rainwater runoff. Heating and cooling is provided by a geothermal heat pump, and all window, appliances and building systems are energy-star rated. The interior of the home features energy-efficient LED, fluorescent and low-voltage lighting throughout. Originally the owners had planned to include a swimming pool, but as a result of the drought they eliminated that option in favor of conserving water and energy. They also sought to reduce their overall environmental impact through the use of locally-made furniture and cabinetry, reclaimed materials, and no-VOC finishes.